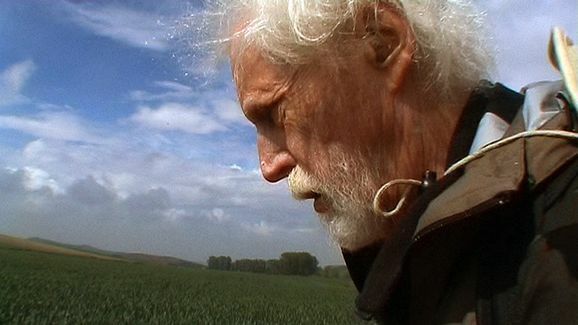 Thor Vilhjálmsson, nestor of Icelandic writers, one of the pioneers of modern literature in Iceland, makes a 40 years old dream come true when he starts his pilgrims walk along the 800 km long St. James Way in northern Spain in the year 2005, when he will become eighty. He is eager to know what will happen to himself within when he encounters the way, his fellow pilgrims from many countries and the inhabitants of the various regions along the way. Icelandic medieval texts originated in the world of the way come alive so to speak when walking and in various places he even walks into, texts, scenes and sets from his own novels. One main theme is said to characterise Mr. Vilhjálmsson writing, the trip. Therefore, in his case, it is easy for him to accept the truth of an old observation that the pilgrims way symbolize life. Flash-backs to France, Iceland and former places on the way are interwoven into his walk which puts into pictures his thoughts and reflections inspired by his experience on his way. Before he embarked on his journey he made an agreement with his worried friend, the well known composer Atli Heimir Sveinsson, that he would send him SMS messages every now and then to ease his mind but he forbids Atli to answer the messages. Atli’s reaction to this is “to answer him” in music. Thor describes himself as a Cultural Pilgrim and he realizes on his pilgrimage the huge cultural heritage that is to be found along the way which needs to be preserved and interpreted for generations to come. And he realizes another observation that has been made saying that the European consciousness is in fact born on the Pilgrims Ways through Europe in the Middle Ages not only to Santiago de Compostela but also to Rome and Jerusalem.